The world is chock full of cupcake books but I just couldn’t resist the title of this latest addition to the cupcake canon. Cupcake Decorating Lab conjures up an image of very serious business pasting frosting onto cupcakes whilst wearing goggles and a white lab coat, it made me imagine production lines of cupcakes being churned out of kitchens across the nation. And indeed we are still churning them out and buying them. 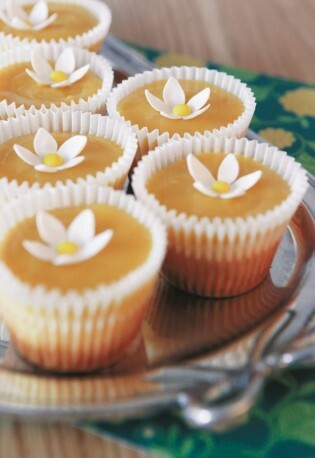 Whilst self announced gourmets may scoff anything but cupcakes, these individually crafted sugar topped treats will not be doing away in a hurry. And this week London’s Time Out blog confirmed just that – whilst baking fashionistas may beg to differ that eclairs (and before them, macarons, cake pops and whoopie pies) are over taking cupcakes as the IT bake, the cold hard facts are that a) cupcakes still sell in far greater quantities than any of their bite size bake companions and b) cupcakes are far easier for even novice bakers to have a bash at. Cupcake Decorating Lab by Bridget Thibeault starts with very basic techniques to top cupcakes and builds up to more detailed sugarcraft techniques. Included are several tricks I’d not considered before – such as these fab Eiffel towers stamped on sugarpaste using food colouring and stationery stamps. 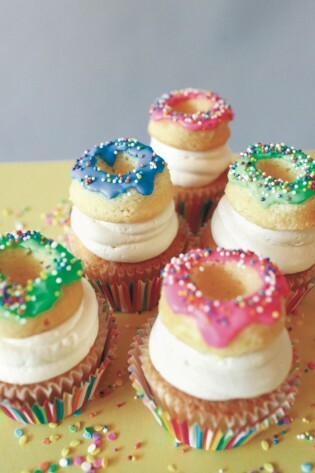 Top of my list to try are: doughnut style cupcakes (pictured above), push pops and buttercream flowers (shown centre bottom on front cover). 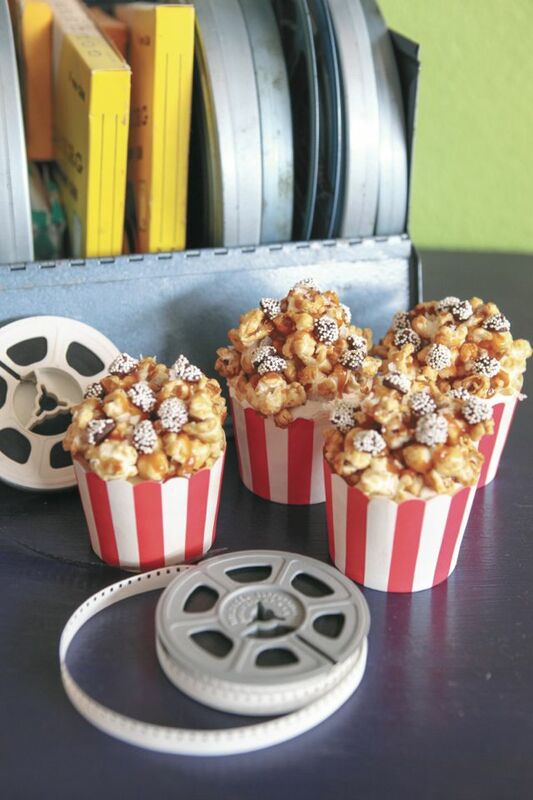 All manner of presentations are covered with cupcake wrappers, giant cupcake cakes and jars; the rear of the book has all the recipes you need to do the projects in the book. The style of the projects leans towards kid friendly and accessible rather than scary mary sugar craft. If you’d like to win one of three copies of Cupcake Decorating Lab follow the instructions below. 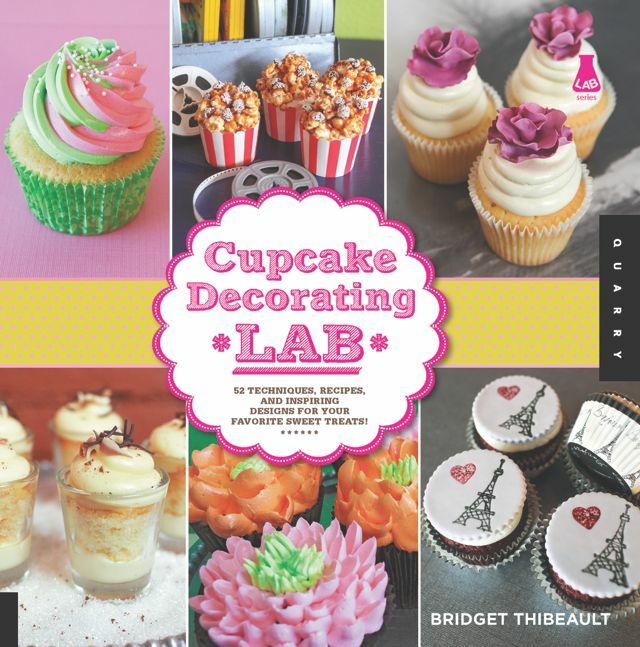 With thanks to Quarry Books for supplying the review and prize copies of Cupcake Decorating Lab. Oooh… I’d be chocolate orange. A little bit of good, a little bit of bad 😉 you need some balance, right? I would be dark chocolate with a hidden caramel filling because I’m really a big softy at heart! I would be a coffee flavored with chocolate icing. strawberry jelly, sweet & a bit wobbly! I would be a chocolate guiness cupcake, rich, sweet a bit of depth and just that little bit naughty! Chocolate Fudge then I would be irresistible! Peanut butter chocolate chip because it is chunky like me. bacon and maple syrup cause i’m a sweet ham! Cappuchino – deep, rich and gorgeous – I wish! Triple chocolate chip – simply because it is my fave!! I would be chocolate because my grandchildren would be able to share ! 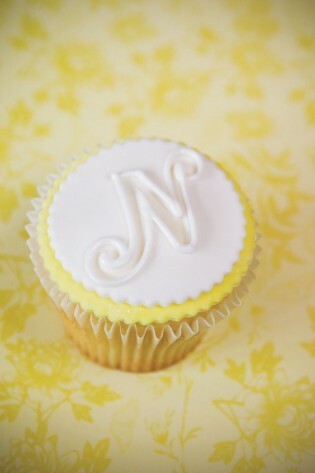 Lemon – not everyone’s favourite but natural and zesty! chestnut pudding with pistachio sprinkles and a raspberry glaze. why– it sounds like it could be delicious. I’d be salted caramel – sweet but with a little kick! pineapple – I’m tropical but I can be a bit difficult at times. A fruity one – nudge nudge say no more! Chocolate and dark orange because I’m fruity, smooth and perfectly sweet! Caramel and nut Smooth on the outside but has a unexpected bite. Something pink, probably strawberry cos i’m sweet and at my best in the summer! I would have to vanilla, as everybody loves this flavour! Lemon, Fresh and fairly popular with most people and easy to get on with. chocolate becuase no-one can resist me! I’d be coffee because I drink so much of it! I’d be a fairy cupcake because I am girly and I love cute things! Rose flavoured – positioned between two thorns! Grapefruit – unusual, not to everyone’s taste but surprisingly nice. Hazelnut – nutty by name, nutty by nature!